This 2CD is essentially a retrospective of Eastley’s installation work. As such, it updates and adds many new examples to the 1975 release “New and Rediscovered Musical Instruments”, which was released as a split LP with David Toop on Brian Eno’s Obscure Records. This is Eastley’s first solo CD. Of the 35 tracks, only the last 2 have any guests or ‘playing’ (the most virtuosic moment being George Lewis playing a grass blade). All the other pieces are either powered by the natural forces of wind and water, or else are motor driven gallery installations. The ethereal sounds of the aeolian harp, the haunting aeolian flutes, and the violent tension of his aerophone installations are hallmark Eastley sounds. These sounds, and many others, sit amidst a wide range of acoustic settings, from windy hill tops to quiet brooks, residential street scenes to coastal shores. The indoor recordings are no less varied, ranging across a rich variety of acoustics and gallery spaces from tiny micro sounds to large scale amplification. Wood, metal and stone are brought to life with electricity. Although there are many photos in the 20 page booklet, much is left to the imagination to work out how the sounds are made. With this limited access to the visual, the focus is pulled towards the musicality of the sounds themselves. This musicality is reinforced by the slow crossfades of most of the pieces from indoors to outdoors to form a series of suites. The recordings mostly date from the mid 70s, but there are pieces from later decades. Nearly everything was recorded either to Revox or Uher and occasionally cassette, using what microphones were available at the time. Recent recordings are digital. The varying quality of the recording set-ups across this 2CD adds yet another dimension to the shifting sound fabric of this anthology. For those inclined to come to terms with the music of John Cage, it almost always comes in stages. The prepared piano is often the gateway, or perhaps the early percussion work. For some it might be the more wild electronics of the sixties, or perhaps they came to it via dance and Merce Cunningham. As one develops ones appreciation one accepts his various ideas: rhythmic structure, silence, the validity of all sounds and finally chance and the reduction of the will of the composer. The notions of chance composition, indeterminacy and attempting to remove from music the composer or performers taste’s and predilections are the most difficult hurdle for most to get past and many people, even those highly interested in contemporary composition, experimental music and the like never do. It is not at all uncommon to meet those who only really enjoy Cage’s early music, losing the thread when chance operations became his primary working method (also you meet those who only appreciate the number pieces, which while chance composed utilize a very carefully chosen set of constraints that reduce certain features that turn many people off of chance composed music. But that is another topic). But chance is the key to Cage’s work, one must accept it, get past that to really appreciate his music. It often is misunderstood as an expediency of composition (and perhaps it was in the European Avant-Garde’s aleatoric music) but for Cage it was the tool he found to help reduce forcing his personal tastes and predilections upon the music. Following this idea to at least one sort of endpoint, what could remove the composer more effectively than creating sculptures that generate sound on their own, often in response to natural events? This two cd set contains short little recordings from these scupltures, as well as performances from some of the more instrument like sculptures. As this set is a document of these installations it doesn’t contain any of the improvised music that Eastley has done with various other musicians. The discs are very well put together, the short excerpts are crafted into extended pieces that all crossfade into each other. The liner notes mark these into sections containing from one to seven tracks and these work quite well as pieces of music. The level of consideration in this assemblage is quite high, sometimes a particular sculpture is returned to several times in one of these “pieces”, which really gives it a flow and makes what could be mere documentation into an captivating piece of music. Of course not everything works, but nothing lasts so long as to dominate, to force the album into one particular shape. It is the sounds of the sculpture that dominate, often metal on metal, odd rotating sounds, clunking wood and the like. It reminds me of the best field recordings in a way, those that aren’t mere documentation but a piece of music. In many ways I think capturing the essence of the natural world, the way that sounds come in and overlap of their own according, those moments of near stasis and the wide range of dynamics, has been a goal of those working with chance based music. Max Eastley is one of the most prolific and revered sound artists of the past half-century or so, experimenting with the sound-making potential of chance, nature and machines since the late 1960s. During that time, in addition to collaborating with artists like Brian Eno, Thomas Koner and the filmmaker Peter Greenaway, Eastley has been a prolific constructor of sound installations both in galleries and out amongst the real-world dynamics of the natural environment. 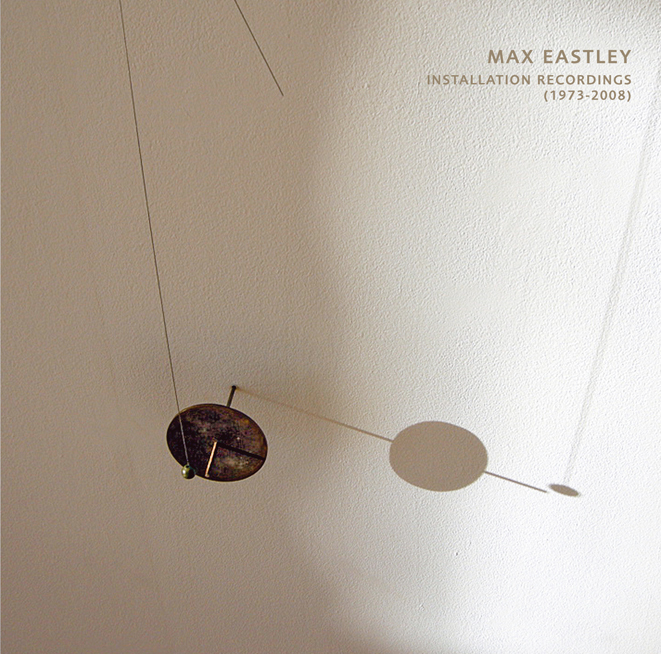 Incredibly, this is Eastley's first solo album, a double-disc retrospective that updates and expands upon the 1975 release "New And Rediscovered Musical Instruments" (a split with frequent collaborator David Toop on Brian Eno's Obscure Records), collecting two hours and thirty-five tracks of indoor and outdoor recordings of Eastley's various sound sculptures, dating between 1973 and 2008. The accompanying 20-page booklet helps provide context for the sounds you're about to hear, presenting an array of photos that give some insight into precisely what a "Centriphone" might look like, and how an "Aerophone" operates. It's often hard to tell from sound alone what's going on, which pays testament to Eastley's ability to wring what are often very alien and unreal timbres from often very natural phenomena. His 'Aerophone' pieces really underline this, capturing incredible, detailed soundscapes made from air vibrations. On the first disc you'll hear a number of these pieces recorded out in the great outdoors of Wiltshire, and at times it all sounds overwhelmingly like a scene from The Birds - layer upon layer of chirruping, cooing and squawking all revealing the intense kinetic activity surging about us, simply in air currents. Recordings of Aeolian harps and flutes operate in a similar fashion, harnessing the indeterminate motions and energies of the environment to stirringly harmonious effect. Inevitably the more modern recordings prove to be more immersive, rendering the spatial dynamics of an installation in greater detail: the percussive 'Stone Circle' recordings (made at Folkstone's Metropole Gallery) from 2008 give a great sense of the sculpture's shape, proportion and position within the stereo field, and likewise the installation for the film 'Clocks Of The Midnight Hours' (recorded in 1990) portrays a chiming trickle of semi-tuned percussion sounds. The final two pieces on the second disc find Eastley in collaborative mode, teaming up with Steve Beresford and Dave Holmes for the engaging mechanical noise and droning tones of 'Whirled Music' (1990), while 'Swung Aeolian Flutes And Grass Blade' (1979) is more adventurous still - it's surely the only piece of music you'll hear any time soon that features a musician credited with playing a blade of grass as an instrument... A great, extensive collection that offers a revealing overview of Eastley's illustrious career. Very highly recommended. Though he's been active as a musician, composer and instrument/installation builder for 35 years, this is Max Eastley's first solo set, a compendium of recordings of his minimal sound-making devices. Beautifully packaged, with many fine photographs of his installations in situ, the discs are sequenced into short suites, with the sounds of one installation blending into the next. The only thing better would be films of these contraptions in operation. The recordings may bring up questions of what music is, what it may be for, and why would anyone take the time to build these things, let alone spend time listening to them. Answers can be found in this catalogue. The sound makers themselves are all deceptively simple, some looking a bit like colorful children's toys while others resemble an odd welding of low-tech machinery to groups of natural objects. So what do these strange gatherings of wood, wire, paper, metal, stone and electricity sound like? Some sound uncannily like nature, birdsong or a babbling brook. Insects. Rising and falling wind-assisted whistling. It's all beautiful stuff, and excellently recorded, especially given the age of some of the recordings. "Motors and Metal Rods" sounds like a randomly played zither or harmonium, which fades after a few minutes to give way to "Aerophones 3", an excited flock of seagulls, overtaken by "Serpentine Gallery Installation", a droning buzz with wooden notes which stop and start. "Installation for the film Clocks of the Midnight Hours" has more wooden notes with metallic chimes. "Stone Circle1" starts with a droning airplane, followed by sounds of dragging and hollow ringing. Some of the sounds are repeated in different contexts/spaces, attaching new overtones and resonances to devices previously heard. "Motors and Metal Rods 2" has some nice bass rumbling and a lot more overtone build up. It's nice to put one of these discs in the player and just let it repeat all afternoon. I do find myself wishing that some of the tracks went on longer, especially disc 1's "Centriphone- amplified and filtered", rising and falling harmonics that shimmer aurally. Now, I have long had problems with sound installations, not because there is anything necessarily wrong with them, but primarily because I don’t experience them often enough to really have developed a personal relationship with the medium, a way of reacting / responding to the idea of standing in a room with others while something other than a human being makes a sound. On each occasion that I have visited an installation piece my responses have been markedly different, ranging from feeling a bit stupid standing alongside others watching not very much happen through to sitting for hours on end completely enthralled. So when I am presented with a CD of sounds captured within an installation scenario this uncertainty about how to respond is just amplified further. The tendency is just to treat it as music, as any other CD, but then no musician has sat down and “played” these recordings as such, and much of the intrigue and wonder held in them is based on this. Many of the tracks on the two discs here are reliant on the wind to give them life, so are these recordings any less musical as a result of the decreased human involvement? Eastley began life as a visual artist and sculptor, and nearly forty years ago, when the earliest recordings here were made, he began to introduce sound into his work. Flicking through the twenty page booklet of photos that accompanies the two CDs I wish I could have experienced some of the sounds included here in person. The visual aspect of many of these installations looks great, ranging from aeolian structures stretching off of the side of sharply inclined hillsides to huge meccano-like outdoors frameworks to smaller more intimate indoor works involving rocks, paper or blocks of wood. There are thirty-five individual tracks here, far too many to try and describe individually, but the pieces tend to fall into a few categories, aeolian recordings of one kind or another- harps, flutes, aerophones etc, percussive recordings, one or two pieces that involve motor driven sculptures, and various combinations of the above. Although recorded across a thirty-five year timespan and involving some twenty-five or so different installations the pieces here all sound like they belong together, like the work of one man focussed on a carefully considered set of approaches for a long time. The tracks are all relatively short, so they really suggest just little glimpses of the sound created by the sculptures. This could be seen as an unsatisfactory way of experiencing these pieces, but short of releasing a thirty-five disc box set, or the listener inventing a time machine this is as satisfactory a way of experiencing Eastley’s works down the years as we can hope for. For sure, some of the pieces would be better served by longer excerpts. Often this listener is left wondering if the part we get to hear is just an edited highlight or if the sound of a particular work might change considerably over time. There are also a number of pieces here that are recorded out of doors, and so we get to hear an element of field recording as well, passing traffic and people, the weather, airplanes etc… I would very much like to have heard a long recording of one of these situations, so the installation can be heard alongside the context of a slowly changing nearby environment. To be fair though, Eastley has done a good job of extending the length of the more varied tracks and keeping the less likely to change pieces brief. There does not feel like there is much filler material, despite the weight of work presented here, and I don’t really feel like we are being shortchanged often with the brevity of the recordings. My personal tastes would have liked to have heard more of the outdoors material, but this album was not made specifically for me. One element of the disc that I do like is the way the pieces are arranged, and then overlapped by a few seconds so that instead of getting thirty-five separate recordings with a space between them there is a sense of a continuum here. My favourite moments are nearly always where the new track suddenly appears and the old begins to fade away, suggesting that maybe there might be more scope to be gained from composing a collage style work using these recordings. I think in some ways I have hit on my main issue with these pieces with this. I struggle to connect with the human element behind the works. Clearly these sounds have been carefully nurtured by Eastley, the installations built so as to capture certain sounds we would normally not hear, but still sounds that occur using mostly natural elements in their formation. I feel distant to that creative instinct however, whereas it may have been more immediate if I had spent time with the installations in person, or if the recordings here had been used to create new music, something with more of a human mark placed upon it. If these had been pure field recordings without the sculptures then perhaps I would not feel this way, as I would know that I was just listening to natural phenomena, nothing else. here though, Eastley’s mark is there on the music, and yet installations presented in this way seem to keep us at arms length from the artist somehow.